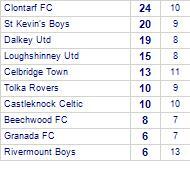 Granada FC are defeated by Transport Iveagh Trust FC. Granada FC has yet to win in this competition, having lost all 6 games. 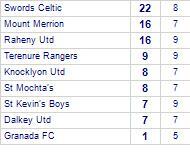 Transport Iveagh Trust FC has yet to be beaten in this competition, having won 6 out of its last 7 games. 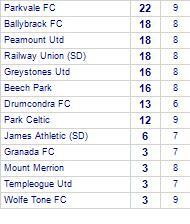 Dalkey Utd claim victory against Granada FC. Granada FC suffer defeat to Glebe North FC. Granada FC has yet to win in this competition. Granada FC claim victory against Beechwood FC. 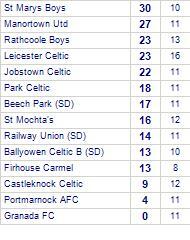 Park Celtic claim victory against Granada FC. Beech Park beat Granada FC. 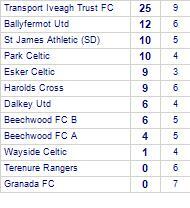 Granada FC despatched by Harold's Cross. Granada FC beaten by St Mochtas. Granada FC win against Bye.